We love cooking with cauliflower, broccoli’s more versatile cousin. It can be used as a healthy alternative to carbs, like in this recipe for “bread.” Pumping up the nutrition, the yeast in this recipe is not only vegan, but full of B vitamins. Mix it up by adding your favorite toppings. 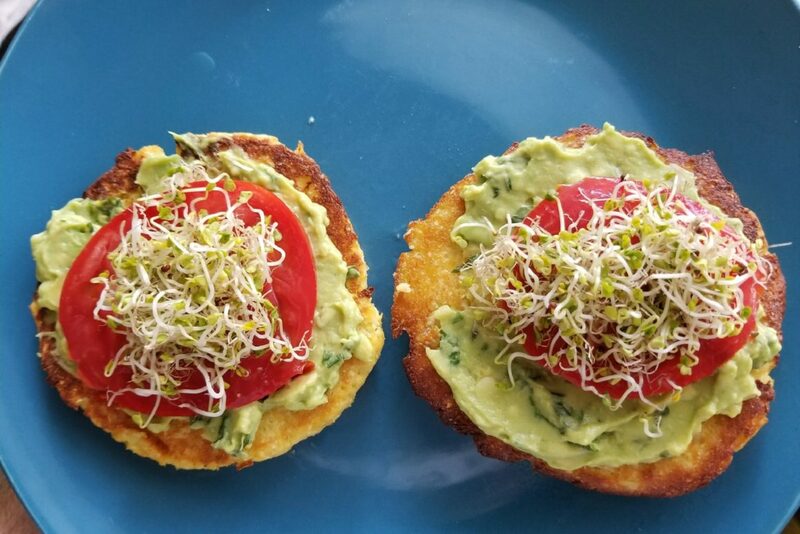 Attune Health nutritionist and research associate Natalie Fortune makes hers with fresh tomato slices and broccoli sprouts. 4 tablespoons of nutritional yeast. Preheat oven to 425 ⁰F. Prepare two baking sheets with cooking spray, or lightly coat with 1 teaspoon of olive oil. Roughly chop the cauliflower into florets. Pulse in a food processor until the cauliflower looks like rice. You will need 4 cups of “riced” cauliflower. Empty the cauliflower onto a clean kitchen towel or cheese cloth. Over a sink, squeeze out all of the extra water from the cauliflower. Empty the dried cauliflower into a large bowl. Mix cauliflower with eggs, nutritional yeast, rosemary and salt. Use a ½ cup measuring cup to portion out the 8-10 pieces of bread. Press cauliflower into a circle that is about a half of an inch thick. Place in oven and bake for approximately 20 minutes or until edges are golden brown. While cauliflower bread is cooking, half and scoop out the inside of two avocados into a medium size bowl. Squeeze the juice of one lemon over the avocado, add the garlic, basil, salt and pepper. Mash the avocado and mix the ingredients until desired smoothness. When the cauliflower bread is out of the oven, let cool on the baking sheets for about 5-10 minutes. Take the bread and top with avocado mixture and any other ingredient you choose.